Planet of Heroes brings all the staple features of a MOBA game but is optimized for mobile gaming with its more simple to access to controls, it is a title that can be played on the go and offers some extra features such as a PVE campaign mode. The developers have focused on optimizing gameplay and matches to be more convenient time lengths, lasting around 7 minutes making them ideal for mobile gamers who want quick gaming sessions in between doing other things. Characters can be further optimized and customized with Runes that give additional effects to their skills, with a range of Runes that can be unlocked players can change up how their characters plays in a match that suits their combat styles. Equipment can also be unlocked and equipped to increase a character’s stats to make them more powerful in combat. The game’s controls are optimized for mobile play, a character is moved around using a touch screen joystick on the left of the screen, with a drag and hold mechanic players have full 360 degree movement to position and aim their character. Abilities, from the characters base abilities to any made available with Runes, Sparks and gear, are positioned on the right of the screen with easy to access buttons; abilities are typically aimed in the direction the player is facing so they can quickly get off a number of simultaneous strikes. The battlemap has one single lane with two allied and enemy tower turrets, a core building that must be destroyed to win the game, a jungle to the bottom of the lane with various camps and an Archon boss that grants team buffs. 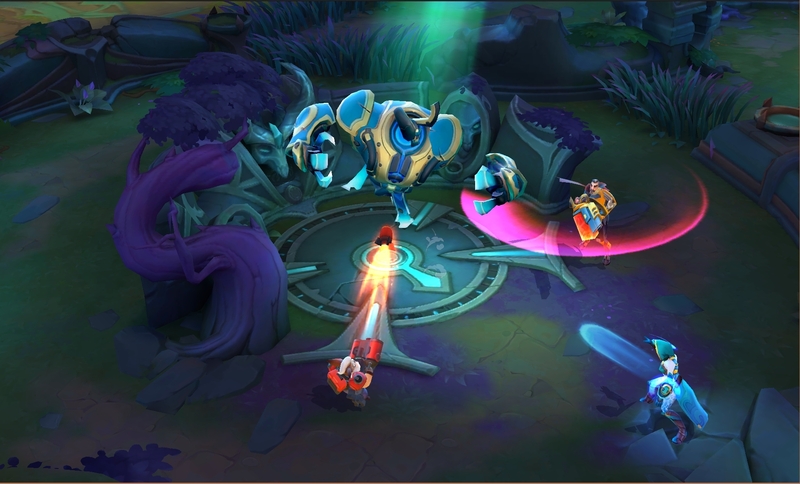 Minions push the lanes from both team’s base and players must use them to take turret shots (as turrets prioritise Minions over Heroes) whilst Heroes fight the enemy players and try to destroy buildings. PVP can be queued as either a Solo match or players can group up with their friends in 3 vs 3 matches. In the PVE Campaign mode players go through solo story content and have five different missions to unlock and complete where they can acquire a variety of items; they take three characters into battle and control one at a time with the other two controlled by the AI, but the player can tap the character’s portrait and switch to that character taking control of it. The maps are like a traditional RPG map and not like the single lane PVP mode, players navigate different areas and fight a variety of enemies and bosses to complete the stage.